There are a few parameters that I want to place on my quest to rediscover Second Life as a fresh-baked newbie. For advice, I revisited a site whose pages pepper my bookmarks: Across the Grid with Lindal Kidd, which is a fantastic blog for new residents of SL. And it’s no wonder: Lindal is a devoted mentor who spends her time at Caledon Oxbridge University helping new members get acquainted with the metaverse. In all my years in Second Life, I’ve never been to Caledon; I was always intimidated by the idea of areas dedicated to role play, but from the descriptions I’ve read, it’s much more about your conduct and the suggestion of themed attire, rather than a requirement. So I’m very much looking forward to checking out the University and perhaps meeting the lovely writer herself! Lindal has made mention of alts a few times, and notes that it’s often easy to spot a veteran who has signed up a new account, versus a true blue newbie. And she’s right: there’s knowledge and know-how that would be difficult, if not impossible, not to rely upon when you start a new account. I don’t need to learn to use the viewer, or figure out movement controls, for example – and to pretend that I did would be both deceptive and make for a pretty stressful ongoing charade. So I’m going to state right in my profile that I’m an alt, link back to my blog, and invite people to share any suggestions, destinations, or landmarks that they may have. For all that I’m familiar with SL in general, I honestly have no idea where to go or what to engage in these days – so meeting other residents who can nudge me in interesting directions will be awesome. So deception is out, and transparency is in. But I do love a bit of mystique, and I’ve decided that I won’t be mentioning the name or any specifics about my main account, since I really do see her as being completely separate from Ever. Chances are, I may not even have reason to log in on that account much anymore – with a few notable exceptions. Big decision time: would I venture bravely into the new/old world with only my cunning and a few SLURLs to freebie places as guidance, or would I transfer Lindens over to my new account? Honestly, the former option was much more appealing! 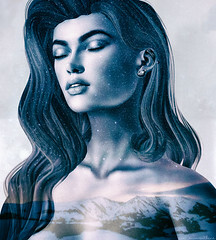 But while it’s often very easy to find quality avatar clothing and accessories for free on the Marketplace, in Hunts, and via Group Gifts, a little preliminary searching has revealed that there will be a couple of sticking points when it comes to taking Ever from Newbie to Beauty: skins, hair, and animation overrides. Where hair is concerned, I have a couple of designers in mind whose groups have a low, well-worth-it joining fee. For animations, my go-to brand is really inexpensive and offers many options. But quality skins may be a challenge, so having some funds to work with may really make a difference. On a lark, I checked the Lindex page on the SL site and found out that the minimum buy amount to add Lindens to your account is $2.50 USD, which the current exchange rate translates to $617L. I’ve seen people in blogs and on the SL forums suggesting that one needs in the realm of 3000, 4000, even 5000 Linden dollars to craft an attractive avie, but I just don’t see it. I don’t need a mesh body or body parts right from the start, and indeed many people never invest in them at all. So I genuinely think that $617L be more than enough to get me started, and yet give me a low enough balance that taking the time to pursue free gifts, hunts, and in-world employment will be worthwhile. Lastly, I want to do all the things I loved when I first joined Second Life nearly a decade ago. I want to explore, to experience, to indulge, to wonder at, and to appreciate this place to its fullest. SL’s residents are some of the most intelligent, creative, and visionary people you can ever hope to meet, and when you’re in-world, the evidence is all around you. In the past, I’ve spent far too much time holed up in a skybox sorting my inventory instead of discovering new places; having an IM conversation instead of exploring the grid with that person; reading blogs and poking around the Destination Guide instead of actively seeing and doing. I’m an introvert at heart, but something many of us forget is that our real lives don’t necessarily have to be a reflection upon our second lives. It’s the difference between what Lindal and others call being an “Immersionist” versus seeing SL as a type of RL placeholder, much like one does on social media. There’s room for all styles of interaction and immersion, but when given the opportunity to reinvent and rediscover yourself in a virtual environment, why not enjoy it for all it’s worth? So here’s to the interesting, intriguing, and immersive adventure to come. Can’t wait! Once upon a time, in a metaverse not-so far away, a young (ish), beautiful (?) maiden (hah!) embarked upon a journey to rediscover the magical kingdom of Second Life by transforming into a creature so formidable, so feared, that we dare only speak its name in hushed tones. She became … a newbie. And so it begins! Welcome to the blog of Miss EverAfterr Resident, my newly-born alt in Second Life. I’m a bit of a wildling in that I’ve only ever experienced Second Life on a “main” account, and mine dates back to the mid-2000s thanks to an invitation a lovely friend who was an early adopter, and later a prolific creator, in-world. I found myself charmed by its potential and possibilities, and I would visit this new Life for several long stretches over the years. But when 2015 rolled around and I found my way back again for the first time in a long while, I logged in and felt – both literally and figuratively – completely lost. Second Life is an ever-shifting microcosm of people and places: where your favorite club from this week can disappear the next; where your friends list often becomes a monument to those who once existed, versus a testament to those who live. Some things change rapidly, and others at a seemingly glacial pace – but the evolution is always there, both behind the scenes and right up in your face. It’s exciting and confusing and endlessly compelling, but Second Life also has the ability to overwhelm even those who have been within its membership ranks for years. And so it was that I wandered around and realized that my inventory was wildly out of date, most of my many and varied landmarks no longer worked, and my friends list was populated entirely by ghosts: RL-to-SL friends who’d long stopped logging in, and souls met in-world whose profiles belied neglect, some even making it clear that they’d decided to leave this Life behind permanently. To any brand new members who may be reading this, please don’t let the transient and transitional nature of Second Life be a dissuasion to you. The reality is that SL is many things to many people (“Your world, your imagination” is the tagline, after all) – it just happens that a place of permanence isn’t always one of those things. But the good news is that the world is always ripe for reinvention, and that’s exactly what I decided to do: to explore, and begin to once again adore, this long-time fascination of mine with a fresh perspective and a fresh start. So today, EverAfterr Resident was born. And a blog as well, because why not? My own RSS feed reader is subscribed to over 80 Second Life related blogs (yes, I’m proudly geeklicious), and as a long-time lover of writing and words, I liked the idea of having a touchstone to share my thoughts, experiences and adventures as a “veteran rookie” back in the metaverse. I hope my adventures make for interesting reads for both new and long-time residents alike, and comments are always welcome. Thank you for coming along for the ride!